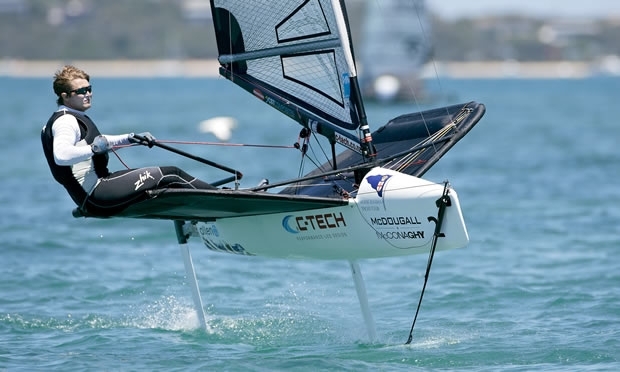 In the weeks leading up to the McDougall + McConaghy 2015 Moth Worlds, defending champion Nathan Outteridge was contemplating who among the 160 entries would be his major competition for the title, and among them was British sailor Chris Rashley. “There are the fulltime Moth sailors who for the past few years have populated the top ten; like Chris Rashley,” Outteridge said at the time. He was right. Rashley and he had gone toe-to-toe at the 2014 Moth Worlds, with the Australian coming out on top on the final day of racing. At that event in Rashley’s playground of Hayling Island, England, he pulled off five wins to Outteridge’s four. It was winning the final race that sealed it for the Australian, the race in which the Brit finished 10th and left him second overall. Fast forward to 2015, neither of the two is leading the Worlds coming into Day 4; that accolade belongs to New Zealander Peter Burling, the 2012 49er Olympic medallist and reigning world champion with Blair Tuke, both of whom were signed by the Emirates Team New Zealand America’s Cup syndicate a year ago. Rashley, currently in fourth place overall, is once again leading Outteridge, who slipped from second overall to sixth after being caught out in the extremely light and fluky conditions yesterday and being timed out in 19th place. That Rashley is so close to the top of the leaderboard is extraordinary. Knowing the talent coming to the McDougall + McConaghy 2015 Moth Worlds, and determined to better his second overall at the 2014 Moth Worlds. Rashley arrived in Sorrento well before the event to practice and get used to the local conditions. However, not long into his stay, the Englishman suffered a disc protrusion. “I collapsed in the street in Sorrento. I could not get up. I was taken to hospital and two days later I was having an MRI. It was a disc protrusion,” Rashley says matter-of-factly, explaining the disc had pulled out from the jelly and straight into his back nerves. After self-protecting, Rashley says his body then started to self-damage. After five days he started physio, a course of steroids and an Epidural, where painkilling drugs are passed into the small of the back via a fine tube. The drug is injected around the nerves that carry signals from the part of your body that feels pain. Two to three days later, and feeling no pain, Rashley was able to take short walks. “On the third day I went for a little sail,” he said. Is it painful? “No, the Epidural took care of that. I can’t solve the disc problem right now; that will take three to six months. Is it bad for your back to go sailing? “No, he says. “And if you walk the beach at these Worlds, you will find lots of guys who have had this problem and some who have it now; it comes from hiking and not being strong in your core. It’s not like I’m the only one,” the understated sailor whose work life includes coaching the British Olympic hopefuls in the Women’s 49erFX class says. Rashley confines his racing to the Moth class. He believes that is what has helped make him so good at it. He has won four Moth European titles and came close with second at the Worlds last year. “This is a much higher-quality fleet,” he admits, recognising the younger and talented America’s Cup, Olympic and world champions in the record fleet of 160. His hopes for these Worlds? “If I can even complete all races it will be a great event for me. To come all this way and not compete would have been terrible, so I feel quite lucky,” the sailor from Southampton says.